This is Willie Bradshaw, owner of Fun Cycles being presented with an award of Super Service Excellence by Suzuki Representative Chris Romska. 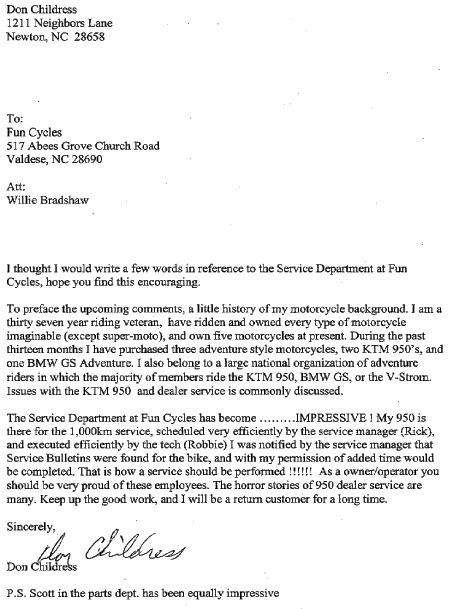 Fun Cycles offers the best service around with a nationally ranked department. We specialize in Victory, Polaris, Suzuki, KTM, E-TON, and United Motors. The technical department maintains certification of all our brands with yearly testing and seminars. We realize the importance of keeping up with new technology and your needs. Our service department offers a vast array of experience to serve your needs. We have a history of excellence obtained through moto cross and cross country racing, ATV use, and daily motorcycle transportation. The staff not only works in the industry, but we purchase and ride the products we sell as well. Robbie Whisenant – Mechanic, 15 years shop mechanic, racing experience. John Bradshaw – ATV mechanic, 15 years ATV shop mechanic. Westin Bonorden – Apprentice mechanic, 5 years street rider experience, 2 years shop experience.